Please note: The Bluetooth smart watch is compatible with Android cellphones perfectly with Android Apk, BUT Apple IOS does not support BT Notice, Sleep Monitor, Pedometer, Messages(SMS) and BT Camera. Notifier: shows the latest 5 messages from WeChat Skype WhatsApp etc. 5. Wait about 5 seconds, it is connected. The Bluetooth 3.0 smart wrist watch support Google Android system perfectly with the Android Apk, you can read the latest 5 messages from Skype, WeChat, WhatsApp etc. on your wrist, BUT Apple IOS does NOT support BT Notice, Sleep Monitor, Pedometer, Messages(SMS) and BT Camera. 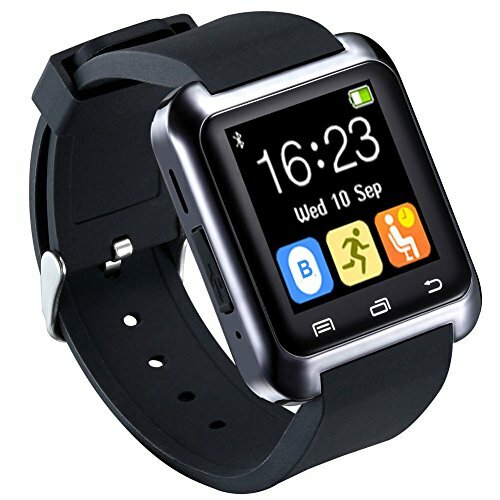 1.48" capacitive touch screen LCD display is protected by metal watch shell, shows Time / Date / Week / Battery State. Just like a smart electronic center on your wrist, remind you to have a rest and have a drink in busy working time, answer or dial calls when driving, read messages, take photo, monitor your sleeping and sports, etc., ringing or vibration reminder when you receive a call or the Bluetooth disconnected. Muli-languages support: English, French, Spanish, Portuguese, Italian, German, Nederlands, Turkish, Russian. View More In Smart Watches. If you have any questions about this product by HopCentury, contact us by completing and submitting the form below. If you are looking for a specif part number, please include it with your message.